Calendar Synchronization is a fabulous service. 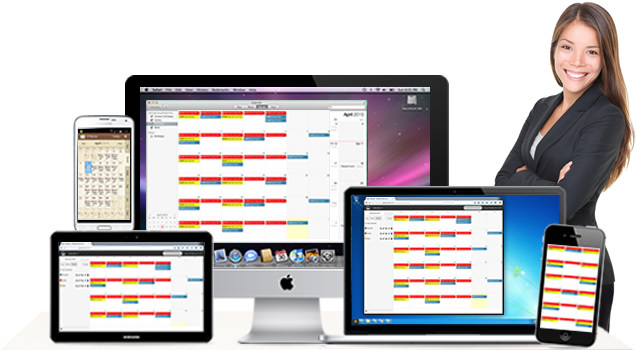 Keep just one set of diary events across all your devices, completely synchronized. Once you use it you will wonder how you ever lived without it. See all of your appointments on all of your devices all of the time ~ then change one and change all! Calendar Sync uses a calendaring extension to the file sync service called CalDAV. CalDav allows your devices, be they mobiles, PCs or Servers, to access scheduling information stored centrally with GlobalClouds. As a change is made to a calender entry on a device it is replicated to the cloud and then on to your other devices. Multiple Calendars can be created in your cloud. For example create a family calendar, a personal calendar, a business calendar all separate. There is no limit. This is done to share different information with different people. Creating and editing different calendar entries is easy. Depending on your client software your scheduling program or app will display one common view of all your calendars allowing you to create new appointments and assign to the calendar of your choice. Different calendars can be shared as read, read/write, read/reshare or read/write/reshare with team members, friends and family as you determine.